I am often confused with the concept of virtualization in operating systems. Considering RAM as the physical memory, why do we need the virtual memory for executing a process? Where does this virtual memory stand when the process (program) from the external hard drive is brought to the main memory (physical memory) for the execution. Who takes care of the virtual memory and what is the size of the virtual memory? Suppose if the size of the RAM is 4GB (i.e. 2^32-1 address spaces) what is the size of the virtual memory? Virtual memory is, among other things, an abstraction to give the programmer the illusion of having infinite memory available on their system. Virtual memory mappings are made to correspond to actual physical addresses. The operating system creates and deals with these mappings - utilizing the page table, among other data structures to maintain the mappings. Virtual memory mappings are always found in the page table or some similar data structure (in case of other implementations of virtual memory, we maybe shouldn't call it the "page table"). 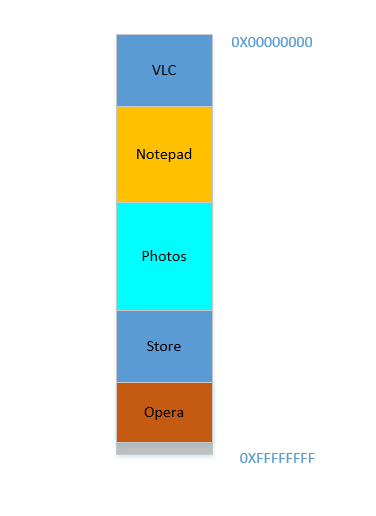 The page table is in physical memory as well - often in kernel-reserved spaces that user programs cannot write over. Virtual memory is typically larger than physical memory - there wouldn't be much reason for virtual memory mappings if virtual memory and physical memory were the same size. Only the needed part of a program is resident in memory, typically - this is a topic called "paging". Virtual memory and paging are tightly related, but not the same topic. There are other implementations of virtual memory, such as segmentation. I could be assuming wrong here, but I'd bet the things you are finding hard to wrap your head around have to do with specific implementations of virtual memory, most likely paging. There is no one way to do paging - there are many implementations and the one your textbook describes is likely not the same as the one that appears in real OSes like Linux/Windows - there are probably subtle differences. I could blab a thousand paragraphs about paging... but I think that is better left to a different question targeting specifically that topic. That the software always runs until user aborts it, i.e. it should not auto-abort because OS has run out of memory. The above activity, while maintaining a respectable performance for the softwares running. Now the main question boils down to how the memory is being managed. What exactly governs where in the memory will the data belonging to a given software reside? Possible solution 1: Let individual softwares specify explicitly the memory address they will use in the device. Suppose Photoshop declares that it will always use memory addresses ranging from 0 to 1023 (imagine the memory as a linear array of bytes, so first byte is at location 0, 1024th byte is at location 1023) - i.e. occupying 1 GB memory. Similarly, VLC declares that it will occupy memory range 1244 to 1876, etc. Every application is pre-assigned a memory slot, so when it is installed and executed, it just stores its data in that memory area, and everything works fine. This does not scale. 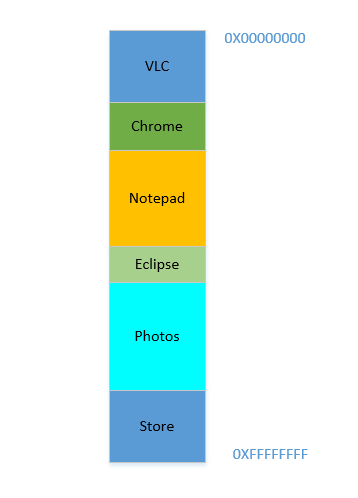 Theoretically, an app may require a huge amount of memory when it is doing something really heavy-duty. So to ensure that it never runs out of memory, the memory area allocated to it must always be more than or equal to that amount of memory. What if a software, whose maximal theoretical memory usage is 2 GB (hence requiring 2 GB memory allocation from RAM), is installed in a machine with only 1 GB memory? Should the software just abort on startup, saying that the available RAM is less than 2 GB? Or should it continue, and the moment the memory required exceeds 2 GB, just abort and bail out with the message that not enough memory is available? It is not possible to prevent memory mangling. There are millions of softwares out there, even if each of them was allotted just 1 kB memory, the total memory required would exceed 16 GB, which is more than most devices offer. How can, then, different softwares be allotted memory slots that do not encroach upon each other's areas? Firstly, there is no centralized software market which can regulate that when a new software is being released, it must assign itself this much memory from this yet unoccupied area, and secondly, even if there were, it is not possible to do it because the no. of softwares is practically infinite (thus requiring infinite memory to accommodate all of them), and the total RAM available on any device is not sufficient to accommodate even a fraction of what is required, thus making inevitable the encroaching of the memory bounds of one software upon that of another. So what happens when Photoshop is assigned memory locations 1 to 1023 and VLC is assigned 1000 to 1676? What if Photoshop stores some data at location 1008, then VLC overwrites that with its own data, and later Photoshop accesses it thinking that it is the same data is had stored there previously? As you can imagine, bad things will happen. So clearly, as you can see, this idea is rather naive. Possible solution 2: Let's try another scheme - where OS will do majority of the memory management. Softwares, whenever they require any memory, will just request the OS, and the OS will accommodate accordingly. Say OS ensures that whenever a new process is requesting for memory, it will allocate the memory from the lowest byte address possible (as said earlier, RAM can be imagined as a linear array of bytes, so for a 4 GB RAM, the addresses range for a byte from 0 to 2^32-1) if the process is starting, else if it is a running process requesting the memory, it will allocate from the last memory location where that process still resides. Since the softwares will be emitting addresses without considering what the actual memory address is going to be where that data is stored, OS will have to maintain a mapping, per software, of the address emitted by the software to the actual physical address (Note: that is one of the two reasons we call this concept Virtual Memory. Softwares are not caring about the real memory address where their data are getting stored, they just spit out addresses on the fly, and the OS finds the right place to fit it and find it later if required). Problem 1: Now you cannot start any other process, for all RAM is used up. Thus programs have to be written keeping the maximum memory available in mind (practically even less will be available, as other softwares will be running parallelly as well!). In other words, you cannot run a high-memory consuming app in your ramshackle 1 GB PC. Problem 2: You cannot move a process. The values of all variables, functions and objects within that process have hardcoded values as spat out by the compiler during compilation, the process depends on them being at the same location during its lifetime, and changing them is expensive. As a result, processes leave behind big "holes" when they exit. This is called External Fragmentation. Holes, once again! Back to square one! Except, previously, the holes occurred due to processes terminating, now it is due to processes requiring less space than before! And you again have the same problem, the holes combined yield more space than required, but they are scattered around, not much of use in isolation. So you have to move those processes again, an expensive operation, and a very frequent one at that, since processes will frequently reduce in size over their lifetime. Problem 3: Processes, over their lifetime, may reduce in size, leaving behind unused space, which if needed to be used, will require the expensive operation of moving many processes. This is called Internal Fragmentation. Cool. Now suppose you again resume watching Avatar in VLC. Its memory requirement will shoot up! But...there is no space left for it to grow, as Notepad is snuggled at its bottom. So, again, all processes has to move below until VLC has found sufficient space! Fine. Now suppose, Photos is being used to load some photos from an external hard disk. Accessing hard-disk takes you from the realm of caches and RAM to that of disk, which is slower by orders of magnitudes. Painfully, irrevocably, transcendentally slower. It is an I/O operation, which means it is not CPU bound (it is rather the exact opposite), which means it does not need to occupy RAM right now. However, it still occupies RAM stubbornly. If you want to launch Firefox in the meantime, you can't, because there is not much memory available, whereas if Photos was taken out of memory for the duration of its I/O bound activity, it would have freed lot of memory, followed by (expensive) compaction, followed by Firefox fitting in. Problem 5: I/O bound jobs keep on occupying RAM, leading to under-utilization of RAM, which could have been used by CPU bound jobs in the meantime. So, as we can see, we have so many problems even with the approach of virtual memory. On the left is the virtual address space of a process. Say the virtual address space requires 40 units of memory. If the physical address space (on the right) had 40 units of memory as well, it would have been possible to map all location from the left to a location on the right, and we would have been so happy. But as ill luck would have it, not only does the physical memory have less (24 here) memory units available, it has to be shared between multiple processes as well! Fine, let's see how we make do with it. When the process starts, say a memory access request for location 35 is made. Here the page size is 8 (each page contains 8 locations, the entire virtual address space of 40 locations thus contains 5 pages). So this location belongs to page no. 4 (35/8). Within this page, this location has an offset of 3 (35%8). So this location can be specified by the tuple (pageIndex, offset) = (4,3). This is just the starting, so no part of the process is stored in the actual physical memory yet. So the page table, which maintains a mapping of the pages on the left to the actual pages on the right (where they are called frames) is currently empty. So OS relinquishes the CPU, lets a device driver access the disk and fetch the page no. 4 for this process (basically a memory chunk from the program on the disk whose addresses range from 32 to 39). When it arrives, OS allocates the page somewhere in the RAM, say first frame itself, and the page table for this process takes note that page 4 maps to frame 0 in the RAM. Now the data is finally there in the physical memory. OS again queries the page table for the tuple (4,3), and this time, page table says that page 4 is already mapped to frame 0 in the RAM. So OS simply goes to the 0th frame in RAM, accesses the data at offset 3 in that frame (Take a moment to understand this. The entire page, which was fetched from disk, is moved to frame. So whatever the offset of an individual memory location in a page was, it will be the same in the frame as well, since within the page/frame, the memory unit still resides at the same place relatively! ), and returns the data! Because the data was not found in memory at first query itself, but rather had to be fetched from disk to be loaded into memory, it constitutes a miss. Fine. Now suppose, a memory access for location 28 is made. It boils down to (3,4). Page table right now has only one entry, mapping page 4 to frame 0. So this is again a miss, the process relinquishes the CPU, device driver fetches the page from disk, process regains control of CPU again, and its page table is updated. Say now the page 3 is mapped to frame 1 in the RAM. So (3,4) becomes (1,4), and the data at that location in RAM is returned. Good. In this way, suppose the next memory access is for location 8, which translates to (1,0). 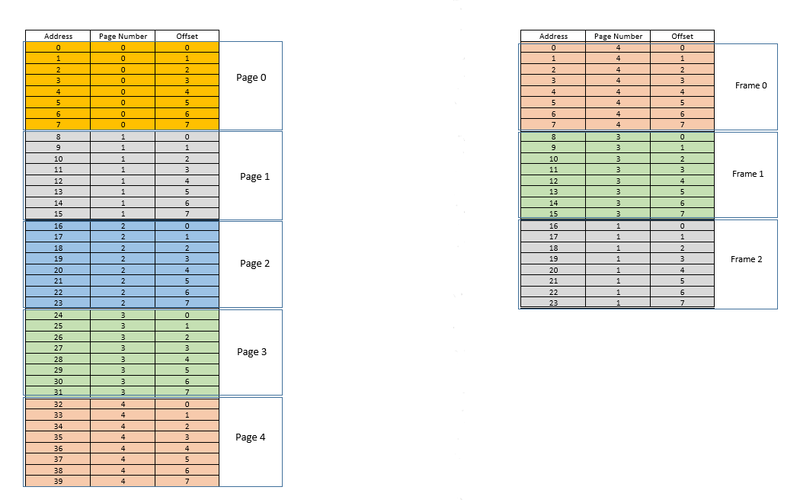 Page 1 is not in memory yet, the same procedure is repeated, and the page is allocated at frame 2 in RAM. Now the RAM-process mapping looks like the picture above. At this point in time, the RAM, which had only 24 units of memory available, is filled up. Suppose the next memory access request for this process is from address 30. It maps to (3,6), and page table says that page 3 is in RAM, and it maps to frame 1. Yay! So the data is fetched from RAM location (1,6), and returned. This constitutes a hit, as data required can be obtained directly from RAM, thus being very fast. Similarly, the next few access requests, say for locations 11, 32, 26, 27 all are hits, i.e. data requested by the process is found directly in the RAM without needing to look elsewhere. Saw what just happened? 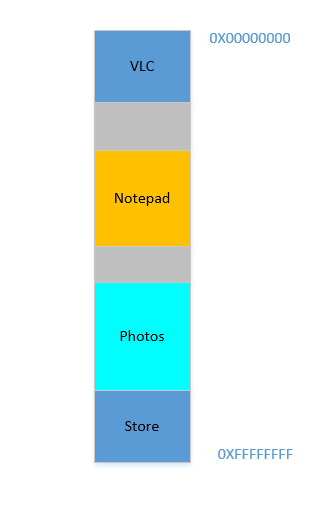 The process had to grow, it needed more space than the available RAM, but unlike our earlier scenario where every process in the RAM had to move to accommodate a growing process, here it happened by just one page replacement! This was made possible by the fact that the memory for a process no longer needs to be contiguous, it can reside at different places in chunks, OS maintains the information as to where they are, and when required, they are appropriately queried. Note: you might be thinking, huh, what if most of the times it is a miss, and the data has to be constantly loaded from disk into memory? Yes, theoretically, it is possible, but most compilers are designed in such a manner that follows locality of reference, i.e. if data from some memory location is used, the next data needed will be located somewhere very close, perhaps from the same page, the page which was just loaded into memory. As a result, the next miss will happen after quite some time, most of the upcoming memory requirements will be met by the page just brought in, or the pages already in memory which were recently used. The exact same principle allows us to evict the least recently used page as well, with the logic that what has not been used in a while, is not likely to be used in a while as well. However, it is not always so, and in exceptional cases, yes, performance may suffer. More about it later. Solution to Problem 4: Processes can now grow easily, if space problem is faced, all it requires is to do a simple page replacement, without moving any other process. Solution to Problem 1: A process can access unlimited memory. When more memory than available is needed, the disk is used as backup, the new data required is loaded into memory from the disk, and the least recently used data frame (or page) is moved to disk. This can go on infinitely, and since disk space is cheap and virtually unlimited, it gives an illusion of unlimited memory. Another reason for the name Virtual Memory, it gives you illusion of memory which is not really available! Cool. Earlier we were facing a problem where even though a process reduces in size, the empty space is difficult to be reclaimed by other processes (because it would require costly compaction). Now it is easy, when a process becomes smaller in size, many of its pages are no longer used, so when other processes need more memory, a simple LRU based eviction automatically evicts those less-used pages from RAM, and replaces them with the new pages from the other processes (and of course updating the page tables of all those processes as well as the original process which now requires less space), all these without any costly compaction operation! Solution to Problem 3: Whenever processes reduce in size, its frames in RAM will be less used, so a simple LRU based eviction can evict those pages out and replace them with pages required by new processes, thus avoiding Internal Fragmentation without need for compaction. As for problem 2, take a moment to understand this, the scenario itself is completely removed! There is no need to move a process to accommodate a new process, because now the entire process never needs to fit at once, only certain pages of it need to fit ad hoc, that happens by evicting frames from RAM. Everything happens in units of pages, thus there is no concept of hole now, and hence no question of anything moving! May be 10 pages had to be moved because of this new requirement, there are thousands of pages which are left untouched. Whereas, earlier, all processes (every bit of them) had to be moved! Solution to Problem 2: To accommodate a new process, data from only less recently used parts of other processes have to be evicted as required, and this happens in fixed size units called pages. Thus there is no possibility of hole or External Fragmentation with this system. Solution to Problem 5: When a process is doing I/O operations, it can easily give up RAM usage, which can be utilized by other processes. This leads to proper utilization of RAM. And of course, now no process is accessing the RAM directly. Each process is accessing a virtual memory location, which is mapped to a physical RAM address and maintained by the page-table of that process. The mapping is OS-backed, OS lets the process know which frame is empty so that a new page for a process can be fitted there. 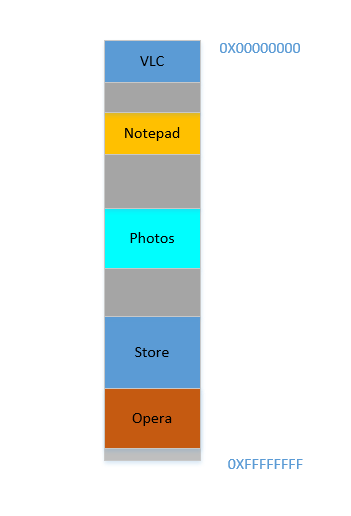 Since this memory allocation is overseen by the OS itself, it can easily ensure that no process encroaches upon the contents of another process by allocating only empty frames from RAM, or upon encroaching upon the contents of another process in the RAM, communicate to the process to update it page-table. Solution to Original Problem: There is no possibility of a process accessing the contents of another process, since the entire allocation is managed by the OS itself, and every process runs in its own sandboxed virtual address space. Paging is, ultimately, giving user the illusion of infinite memory by using disk as secondary backup. Retrieving data from secondary storage to fit into memory (called page swap, and the event of not finding the desired page in RAM is called page fault) is expensive as it is an IO operation. This slows down the process. Several such page swaps happen in succession, and the process becomes painfully slow. Ever seen your software running fine and dandy, and suddenly it becomes so slow that it nearly hangs, or leaves you with no option that to restart it? Possibly too many page swaps were happening, making it slow (called thrashing). Why do we need the virtual memory for executing a process? - As the answer explains at length, to give softwares the illusion of the device/OS having infinite memory, so that any software, big or small, can be run, without worrying about memory allocation, or other processes corrupting its data, even when running in parallel. It is a concept, implemented in practice through various techniques, one of which, as described here, is Paging. It may also be Segmentation. Where does this virtual memory stand when the process (program) from the external hard drive is brought to the main memory (physical memory) for the execution? - Virtual memory doesn't stand anywhere per se, it is an abstraction, always present, when the software/process/program is booted, a new page table is created for it, and it contains the mapping from the addresses spat out by that process to the actual physical address in RAM. Since the addresses spat out by the process are not real addresses, in one sense, they are, actually, what you can say, the virtual memory. Who takes care of the virtual memory and what is the size of the virtual memory? - It is taken care of by, in tandem, the OS and the software. Imagine a function in your code (which eventually compiled and made into the executable that spawned the process) which contains a local variable - an int i. When the code executes, i gets a memory address within the stack of the function. That function is itself stored as an object somewhere else. These addresses are compiler generated (the compiler which compiled your code into the executable) - virtual addresses. When executed, i has to reside somewhere in actual physical address for duration of that function at least (unless it is a static variable! ), so OS maps the compiler generated virtual address of i into an actual physical address, so that whenever, within that function, some code requires the value of i, that process can query the OS for that virtual address, and OS in turn can query the physical address for the value stored, and return it. Suppose if the size of the RAM is 4GB (i.e. 2^32-1 address spaces) what is the size of the virtual memory? 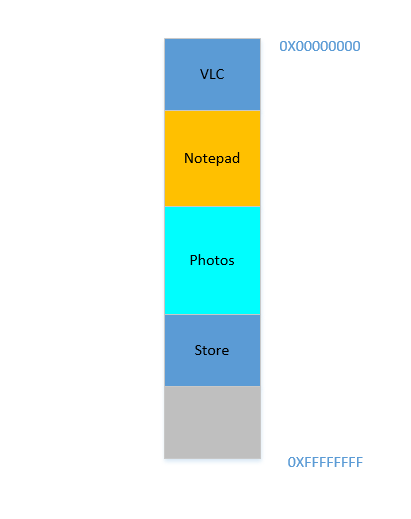 - The size of the RAM is not related to the size of virtual memory, it depends upon the OS. For example, on 32 bit Windows, it is 16 TB, on 64 bit Windows, it is 256 TB. Of course, it is also limited by the disk size, since that is where the memory is backed up. 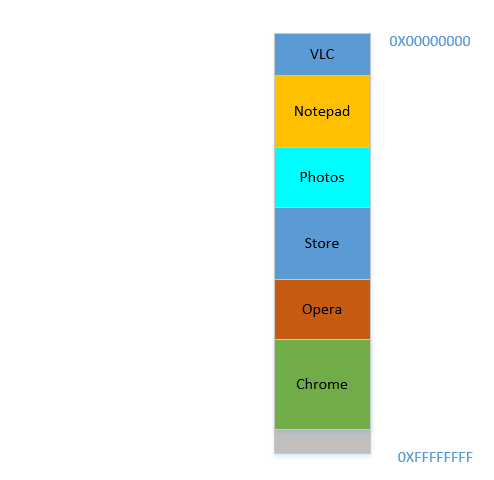 VIRT -- Virtual Image (kb) The total amount of virtual memory used by the task. It includes all code, data and shared libraries plus pages that have been swapped out and pages that have been mapped but not used. Virtual memory is stored on the hard drive and is used when the RAM is filled. Physical memory is limited to the size of the RAM chips installed in the computer. Virtual memory is limited by the size of the hard drive, so virtual memory has the capability for more storage. Not the answer you're looking for? Browse other questions tagged memory-management operating-system virtualization ram virtual-memory or ask your own question. How Virtual Memory isolate different processes? Why is the size of a pointer less than the addressable size of virtual memory space?